Only minutes before the start of the 54th Annual GRAMMY Awards, several members of the 2012 audio team gathered for a photo. Pictured L-R: Top Row: Toby Scott, Bruce Springsteen Engineer; Hank Neuberger, GRAMMY Award Telecast sound supervisor; John Harris, Co-Broadcast Music Mixer; Glenn Lorbecki, Recording Academy Secretary/Treasurer; Bob Clearmountain, Bruce Springsteen Engineer. Bottom Row: Eric Schilling, Co-Broadcast Music Mixer; Leslie Ann Jones and Phil Ramone, GRAMMY Award Telecast sound supervisors; and Maureen Droney, P&E Wing Senior Executive Director. SANTA MONICA, Calif. (Feb. 16, 2012) — The 54th Annual GRAMMY Awards® on Sunday, Feb. 12, 2012, showcased an amazing collection of musical performances and tributes and utilized the latest in technology to provide television viewers worldwide with a cutting-edge, high-definition/5.1 surround sound event. The GRAMMY Awards' technical staff consists of audio pioneers who continually strive to employ the latest in HDTV and 5.1 technology to enhance the show. The Recording Academy® Producers & Engineers Wing® members Phil Ramone and Hank Neuberger again supervised the broadcast audio, while fellow P&E Wing member Leslie Ann Jones supervised the house audio. Caption: Only minutes before the start of the 54th Annual GRAMMY Awards, several members of the 2012 audio team gathered for a photo. Pictured L-R: Top Row: Toby Scott, Bruce Springsteen Engineer; Hank Neuberger, GRAMMY Award Telecast sound supervisor; John Harris, Co-Broadcast Music Mixer; Glenn Lorbecki, Recording Academy Secretary/Treasurer; Bob Clearmountain, Bruce Springsteen Engineer. 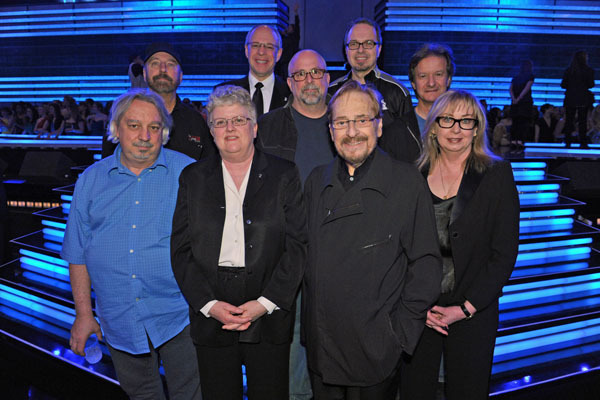 Bottom Row: Eric Schilling, Co-Broadcast Music Mixer; Leslie Ann Jones and Phil Ramone, GRAMMY Award Telecast sound supervisors; and Maureen Droney, P&E Wing Senior Executive Director. Photograph courtesy of The Recording Academy®/Wireimage.com © 2012. Photograph by John Shearer. Established in 1957, The Recording Academy is an organization of musicians, producers, engineers and recording professionals that is dedicated to improving the cultural condition and quality of life for music and its makers. Internationally known for the GRAMMY Awards — the preeminent peer-recognized award for musical excellence and the most credible brand in music — The Recording Academy is responsible for groundbreaking professional development, cultural enrichment, advocacy, education and human services programs. The Academy continues to focus on its mission of recognizing musical excellence, advocating for the well-being of music makers and ensuring music remains an indelible part of our culture. For more information about The Academy, please visit www.grammy.com. For breaking news and exclusive content, follow @TheGRAMMYs on Twitter, like "The GRAMMYs" on Facebook, and join The GRAMMYs' social communities on YouTube, Tumblr, Foursquare, GetGlue, and Instagram.